Yesterday, 40°F and sunny. Hubby and I spent the day shopping and celebrating his 67th birthday. Today, 32°F and snowing. Prediction was 1-2" by 7 PM. I think the hyphen was added in error, because it is 4 PM and we have 12" of snow already on the ground and it's still coming down at a good rate. 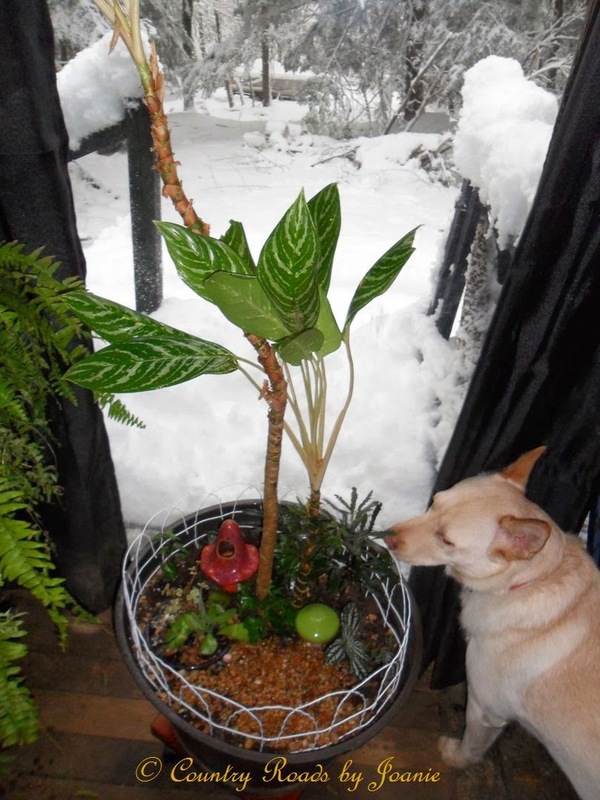 I must have had an inkling of snowy days ahead as hubby and I spent a good deal of time at the Lowes garden center picking up several small house plants of. We also rescued a couple of bromeliad from the discount table which have gone by but have new growth, so there is promise. I've been fascinated with fairies since being a youngster and including them on my mirror wall art has rekindled that fascination over the last several months. Every where I go I look for fairies. The other day while browsing the net I ran across pictures of fairy gardens and decided I had to have one. We have a plant that I call a variegated tree because I haven't been able to figure out what kind of plant it is. There are 2 more smaller ones in the dining room. The pot containing the larger plant was the perfect spot to plant my fairy garden. Most people lose plants due to over watering or under watering. We lose plants because of indoor cats that have found it is fun to dig in dirt, and over sized dogs who think plants are there to sweeten their breath. It took a bit of shopping around, but I was able to find a length of wire fencing that could be cut down and placed around the rim of the pot. Hopefully this will discourage an attack by furkids. Here's my project. It is my understanding that fairy gardens are forever undergoing changes as fairies are busy little creatures and there's much to do in fairy land. I'm sure we'll see many changes and additions over the coming months. Thanks for stopping by on this snowy New England day.